What is eventing? Eventing (or sometimes referred to as Horse Trials) originally evolved from the training and selection of cavalry horses, today it is three equestrian disciplines (dressage, show jumping and cross country) combined and competed by horse and rider as a combination. Each of the three disciplines is designed to test the horses ability - dressage shows how trainable the horse is and its basic paces in walk, trot and canter. The show jumping shows athleticism, control and accuracy while the cross country tests stamina, speed, jumping and bravery. The sport is rather like the triathlon in that it combines different disciplines in one competition and is run on a cumulative penalty basis. The competitor with the least penalties at the end is the winner. The first test is dressage, which comprises a set sequence of compulsory movements in an arena. The test is judged by one or more judges who are looking for balance, rhythm and suppleness and most importantly, obedience of the horse and its harmony with the rider. Each movement is scored out of ten with the total being added up and converted to a penalty score. The cross country phase is a course of natural obstacles that have to be jumped - again inside an optimum time - being over the time incurs penalties and being too fast it is of no benefit and unnecessarily tires the horse. Stopping at obstacles or falling off also incurs penalties. The show jumping phase is one round of jumping over fences that can be knocked down with a maximum time allowed. The fences are not as high as top level show jumping but are quite substantial for horses which are not specialists at show jumping. Fences knocked down and refusals incur penalties as does exceeding the time allowed. Eventing is often referred to as the Equestrian version of triathlon because of its three differing phases - Dressage, Jumping and Cross Country. From its fox hunting beginnings in the 19th century, to military dominance in the 20th, the sport changed immeasurably in the 21st century. Eventing became an Olympic sport at the Stockholm Games in 1912. It was only open to amateur riders who were in the military. The purpose was to test the cavalry on their fitness and suitability. Dressage showcased skills from the parade ground, the jumping phases demonstrated speed and stamina. 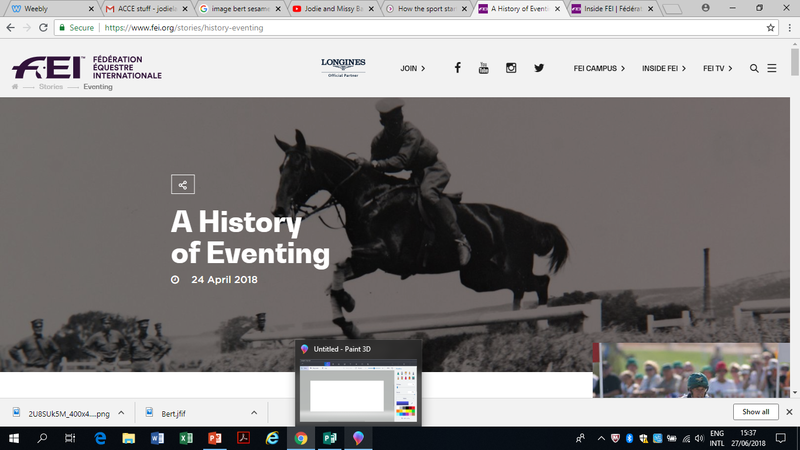 If you want to know more about the history of Eventing click on the link to the FEI page which does a fantastic job of explaining the origins and evolution of the sport.